The 32 foot tall menorah, the maximum size allowed by Jewish law, has been gracing Grand Army Plaza during the Chanukah season since 1984. 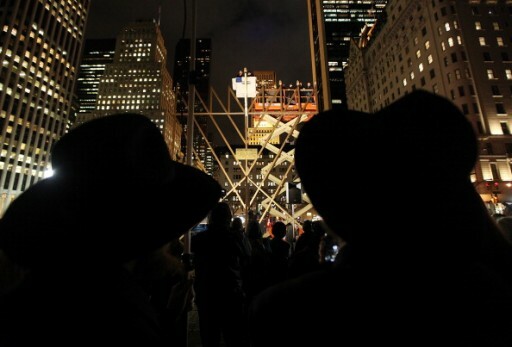 The menorah is lit each year by Rabbi Shimon Hecht and various community leaders who climb aboard a cherry picker to light the oversized candles. But while Chabad of Park Slope has been touting the menorah as the world’s largest, that claim has been disputed by Rabbi Shmuel Butman who has been lighting a menorah of equal height designed by Israeli artist Yaacov Agam across from Central Park for approximately forty years. Although Guinness World Records certified the 4,000 pound Manhattan menorah as the world’s tallest in 2006, the Brooklyn menorah actually has a height advantage of several inches because of its longer shamash. A decision handed down by a Chabad bais din published on CrownHeights.info decided in favor of Rabbi Butman and his Manhattan menorah, noting that the Brooklyn menorah had no right to use the phrase “world’s largest menorah” when it was already in use by another group. In keeping with the bais din’s ruling the website WorldsLargestMenorah.com now redirects to a page of the Chabad of Park Slope website with the header “The Largest Menorah Brooklyn New York.” A Facebook page dedicated to the menorah changed its profile picture on December 8th to a photograph bearing the same verbiage. Rabbi Hecht’s son, Rabbi Moshe Hecht, told news outlet Brooklyn Paper that Chabad of Park Slope was concentrating not on semantics but on the upcoming holiday. 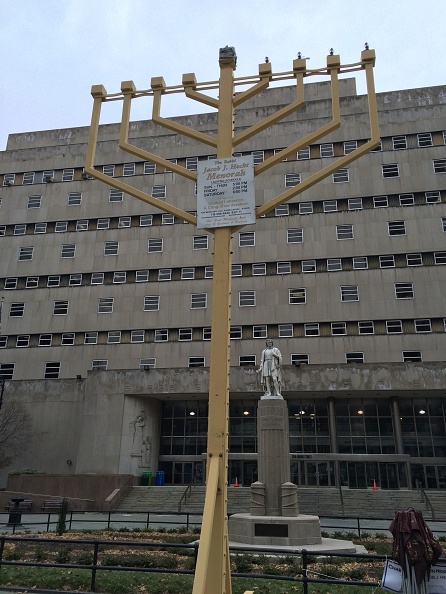 A third official menorah located in Brooklyn Heights in front of the Brooklyn Supreme Court building near Borough Hall, clocks in at 25 feet and gives Kings County at least some bragging rights. Oy. So embarrassing. Perhaps the Beis Din made a bigger chillul Hashem by even taking up this issue then what the media could have ever done. Besides, why can't manahattan be the largest counting width and brooklyn be the tallest (it is). Glad that's worst thing going on in lubyville. Only a bes din from CHELM would even think of this nariskeit to get involve. I am embarrassed. Both parties are as bad as the other - I don't know which one started it, but the other was clearly quite happy to join in. This was news on the Chabad websites a few weeks ago & for what it's worth, EVERY comment was one of disgust, embarrassment and ridicule. Another popular response was contempt for their egos. Please understand: it seems these two have nothing more pressing to worry about. But the reality is, they really do. Don't judge the level of common sense in Chabad by these two. The vast majority of us, including our Shluchim and educators, would never let such a stupid, petty squabble over something so ridiculous reach these epic proportions. I am just as certain the Rebbe would have nipped this craziness in the bud at the first "mine is bigger than yours." This is NOT what we are about & they certainly don't represent Chabad. How's about calling one the "largest" and one the "biggest"? Kind of like how (before they merged) the two biggest makers of Swiss Army Knifes agreed that one could be the "original" and one the "genuine"
“ I am embarrassed. Both parties are as bad as the other - I don't know which one started it, but the other was clearly quite happy to join in. This was news on the Chabad websites a few weeks ago & for what it's worth, EVERY comment was one of disgust, embarrassment and ridicule. Another popular response was contempt for their egos. Unfortunately, Lubavitch Youth Organization simply DOES represent Chabad/Lubavitch in the Greater New York City area (and possibly also Long Island!). Also, this Bais Din DOES also represent Lubavitch - it is Vaad Rabbonei Lubavitch of the U.S.A. and Canada. Therefore, although you, Mr. "Lubavitcher" are NOT representative of Lubavitch, these parties and rabbonim involved in this foolishness ARE prime representitives of Lubavitch. I credit them for going to BD. Many in their community simply go to court. With all the fraud and child molestation in our community, this is what they focus on? This is apropos for the naarishkeit of lighting a menora in the street. “ This is apropos for the naarishkeit of lighting a menora in the street. I agree. The nararishkeit of lighting "neros in the courtyards" - there is nothing Jewish about it, total Xtianity! Sadly, the "Haneros Hallolu" records the lighting of the "neros" in the courtyards. We must immediately change the "Haneros hal'olu" by deleting "v'hidliku neros b'chatzros kodshecha". Then the Haneros Halolu will conform to Lakewooder's Judaism. Let us make an Asifa! “ I agree. The nararishkeit of lighting "neros in the courtyards" - there is nothing Jewish about it, total Xtianity! Sadly, the "Haneros Hallolu" records the lighting of the "neros" in the courtyards. Good point but you probably mean the "Al Hanissim" (not "Haneros Hal'olu"). There are valid sources for outdoor public lighting of menoras but suffice to say that the Lubavitcher Rebbe was a recognized godol b'Torah v'halacha, and if he says so, that is good enough for us (even if we have another custom or follow another shitah). The Chasam Sofer (Derashos Vol 1, pg 67) writes that they removed the Menorah from the Temple, and lit its candles outside, in the Temple courtyard. He cites proof that such a lighting is indeed permissible. Incidentally, this caused the miracle of Chanukah to receive much greater public recognition than it would have had the Menorah been lit in the Temple sanctuary, where only the Kohanim would have been privy to the miracle. Today too we can also bring this form of persumei nissa by lighting menoras in public "courtyards", and a brocha can be recited on a lighting of persumei nissa (as evident in the lighting at shul). Outdoor menorah lighting is an old debate. Is it a mitzvah or not? Lubavitch does it. Litvish generally don't (with some minor exceptions). To each his own. Be respectful of others. Now move on. There is nothing new here.